Tambour Door Cabinets store more material in less space than ordinary vertical or lateral file cabinets. The smooth-gliding, locking tambour doors retract into the cabinet walls for fast access to contents without taking up additional floor space. A 3-point locking mechanism keeps all of your supplies secure with just one key. Available for these cabinets are interior components that allow you to store binders, manuals, books, media, supplies, hanging files, and more in less than 5 square feet of floor space. Components adjust up or down in 1" increments and can be easily reconfigured as your storage needs change. Choose from three cabinet heights in your choice of silver, light gray, dark gray, or black. Components are available in black only. To design a cabinet, choose the combination of components you need and total the vertical space required for all. Then select the appropriate cabinet height. Cabinets are shipped flat, ready to assemble. 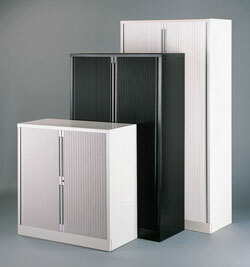 For media storage, click here for Multimedia Tambour Door Cabinets. Preconfigured 78" Tambour Cabinet Kits are also available and offer savings over items sold separately. Click here for contents and photos of available models.